Minnesota no longer enforces its own gift tax, but you may still owe one at the federal level if you exceed your lifetime gift and estate tax exemption. However, the Tax Cuts and Jobs Act signed into law by President Trump raised that limit to $11.18 million for 2018 and $11.4 million in 2019 per individual. Still, you may need to report a gift if it’s valued at more than $15,000. But don’t worry. We’ll explain exactly how gift taxes work and what you need to watch out for. We’ll also explain how to make non-taxable gifts and steer clear of a potential gift tax. We can also help you find a financial advisor who can guide you through the entire estate planning and charitable giving process. So let’s begin with exploring what the IRS taxes in the first place. What’s a Gift When It Comes to Taxes? While there is a federal gift tax, some states also enforce their own. Minnesota, though, repealed its gift tax several years ago. So you’d only need to worry about the federal one if the gifts you make exceed a large amount in value. We’ll explain. Every person has an annual gift tax exclusion. You can provide gifts valued at this amount to any individual without worrying about Uncle Sam. The Trump Tax Plan increased the annual gift tax exclusion to $15,000 per person for 2018 and 2019. That means you can give any number of individuals $15,000 each without even having to report it. This threshold typically increases each year to keep in line with inflation. But if your gift to someone exceeds this amount, you’d need to fill out IRS Form 709 come tax season. Officially, this is called the U.S. Gift (and Generation-Skipping Transfer) Tax Return. But when you provide someone with a gift valued at more than that annual gift tax exclusion (currently $15,000), you begin to reduce your lifetime gift tax exclusion. How Does the Annual Gift and Estate Tax Exemption Work? Under the new tax law, the federal lifetime gift and estate tax exemption stood at $11.18 million and roughly twice as much for married couples in 2018. It climbed to $11.4 million for 2019. These amounts can fluctuate each year unless Congress makes them permanent. Remember, the applicable lifetime gift and estate tax exemption is the value of gifts you’re allowed to give before you’d owe an actual out-of-pocket gift tax. As we mentioned before, you begin to reduce this amount after you’ve given someone more than $15,000 in a year or whatever the annual exclusion is at the time. So if you cross the $11.18 million mark in 2018 or if you breach the $11.40 million threshold in 2019, you’d owe an out-of-pocket gift tax on the value of gifts that exceeded that amount. So if the applicable lifetime gift and estate tax exemption was $11.18 million and you gave away $12.18 million, the IRS would tax you on the difference, or $1 million. Depending on how far you exceed the lifetime exemption, the federal gift tax rate can be as high as 40%. But keep in mind that the lifetime exemption applies to the estate tax as well. In other words, you can leave less of your estate to your heirs tax free if you begin to eat away at your lifetime exemption. In this case, the federal government can tax a portion of your taxable estate at a rate as high as 40%. Moreover, the state of Minnesota applies its own estate tax. This is why seeking help from a financial advisor versed in estate planning can be a greatly beneficial move for Minnesotan families. What is the Minnesota Estate Tax? As you can see, the federal government starts taking a cut from the portion of your estate that you pass on to heirs if it’s valued above a certain threshold. That’s the same case with the Minnesota estate tax. For 2018, that threshold was $2.4 million. The state legislature set it to increase to $2.7 million in 2019 before it peaks at $3 million in 2020. So in essence, one way to protect what you leave behind to your loved ones from the government is by reducing the size of your estate while you’re alive. A qualified financial advisor can guide you through this process based on a strategy tailored to your personal financial goals. But we’ll cover some common practices you may be interested in. One way you can reduce the size of your taxable estate while you’re alive is by taking advantage of your annual gift tax exclusion. As of 2018 and 2019, you can give $15,000 to any number of individuals without having to report your gifts to the IRS. In other words, you can give this amount to your children and grandchildren, for instance, without having to worry about taxes. But what if you feel they’re too young to manage such a large sum on their own? You can always set up a trust fund and designate them as beneficiaries. With an irrevocable trust, for example, the assets in the trust won’t be transferred to your children until after you pass away. And when you transfer assets toward an irrevocable trust, those assets cease being yours in the eyes of the IRS. This move effectively reduces your taxable estate. The transfer itself would count as a gift, however. But you can steer clear of the gift tax if you stick to the annual exclusion and watch your lifetime exemption. You can also choose a trustee such as a qualified financial professional to manage trust assets in the best interest of your beneficiaries. But because there are so many types of trusts out there with their own rules and legal stipulations, you should establish one with the guidance of an attorney and financial advisor with an expertise in estate planning. What’s Not Subject to the Gift Tax? Spouse: You can give as much as you want to your husband or wife without worrying about gift taxes as long as your spouse is a U.S. citizen. Otherwise, you have an annual limit ($152,000 for 2018) to give your spouse before it begins to eat away at your lifetime exemption. Educational Expenses: When you send a payment to an educational institution to cover someone else’s tuition costs, the IRS doesn’t consider it as a taxable event. It will, however, if you send it to the student. And keep in mind that this applies to tuition only. Other educational expenses such as books and mandatory fees don’t count. However, you can cover these expenses by contributing toward a 529 college savings plan on behalf of someone else. 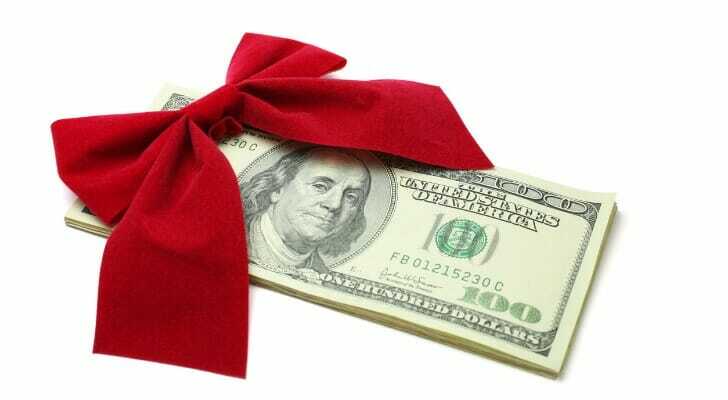 The IRS also allows special gift tax exemptions when it comes to these types of plans. A 529 plan is a savings vehicle that allows you to save for your child’s future education as soon as possible. Think of it as a 401(k) for college expenses. You can contribute toward an investment portfolio that can grow tax-free to help your child cover eligible educational expenses. In addition to tax breaks inherent to 529 plans, these savings vehicles also carry special gift tax exemptions. The IRS allows you to contribute up to $75,000 toward a 529 plan without reducing your lifetime exemption as long as you agree to not make any more contributions toward a plan for the same beneficiary in the next five years. Essentially, the IRS lets you use up to five years of your annual exclusion ($15,000 x 5 in 2018 and 2019) in one shot. That’s how it works if you make a lump-sum contribution of $75,000. Any other amount between that and $15,000 would be pro-rated. So if you contribute $30,000 in 2019, you’ve used up two of your annual exclusions. So you’re limited from contributing to the plan for the next three years instead of five. What Else Should I know About the Gift Tax? While the lifetime gift and estate tax exemption rose dramatically thanks to the Tax Cuts and Jobs Act, it’s scheduled to expire at the end of 2025. So on January 1, 2026, it may revert back to its pre-2017 level of $5.49 million for individuals. And while individuals have to report a gift that exceeds the year’s annual exclusion amount, couples making joint gifts have to report all of these even if they don’t exceed $15,000. While Minnesota doesn’t currently enforce a gift tax, the federal government does. However, you get to make gifts valued at up to $15,000 in 2018 and 2019 to any number of individuals without worrying about gift taxes. This is known as the annual gift tax exclusion, which can change from year to year. When you exceed the annual gift tax exclusion, you begin to reduce your lifetime gift and estate tax exemption. For 2018 and 2019, this amount hovers around $11.2 million for each individual. This amount is scheduled to expire in 2026. Nonetheless, you’re subject to paying an out-of-pocket gift tax only when you surpass the applicable lifetime gift and estate tax exemption amount. Making non-taxable gifts and reducing the size of your estate by investing in certain types of trust funds can help shield what you want to give away. But the process can be complex unless you do it with the guidance of a professional financial advisor and attorney. To help, we developed our SmartAsset financial advisor matching tool. It connects you with up to three advisors in your area who can help. It also gives you free access to the advisors’ profiles, so you can review their qualifications before choosing to work with one. Once you’ve narrowed down your choices, there are a few points you should keep in mind before deciding to work with a financial advisor. To help, we gathered the five questions to ask when choosing a financial advisor. Creating some types of trusts can help reduce your sizable estate and protect gifts to your loved ones from taxes. But they can be complex considering all the different types of trusts and their rules. To help, we’ve published an in-depth report on how trusts work. The post Minnesota Gift Tax: All You Need to Know appeared first on SmartAsset Blog.